For car makers out there who plan to launch an estate model, it would seem the worst thing you can ever do is describe your new model as just that. BMW have their estate ‘Touring’ models, Audi their ‘Avant’ range and now Jaguar have this, welcome to the ‘Sportbrake’. 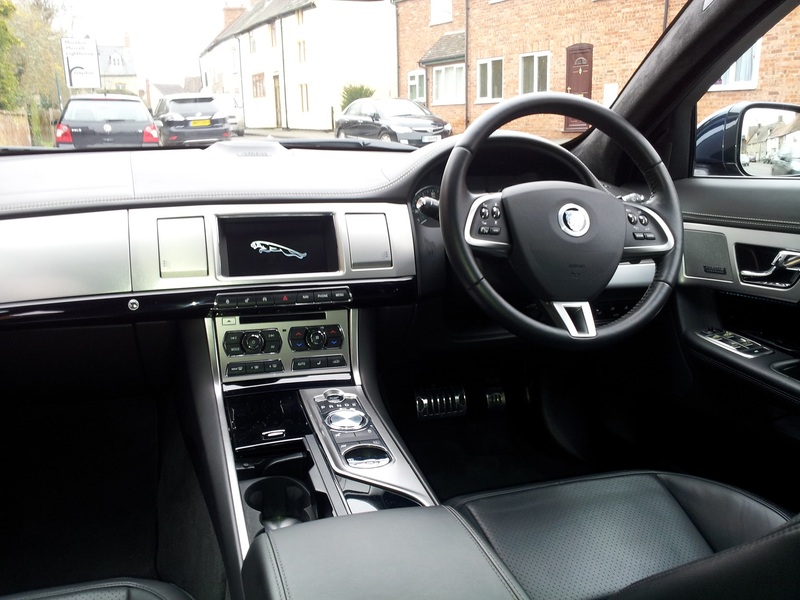 2013 Jaguar XF Sportbrake 3.0 Diesel S Portfolio. Price: From £31,945 (as tested £51,505). The Sportbrake is not Jaguar’s first estate variant – that accolade fell to the X Type model from the early noughties. This was a popular model right through until its 2009 withdrawal and was enough to convince Jaguar that there was certainly a market for a more practical alternative to its usual saloon models. Particular credit should be given to Jaguar’s design team led by the acclaimed stylist, Ian Callum. 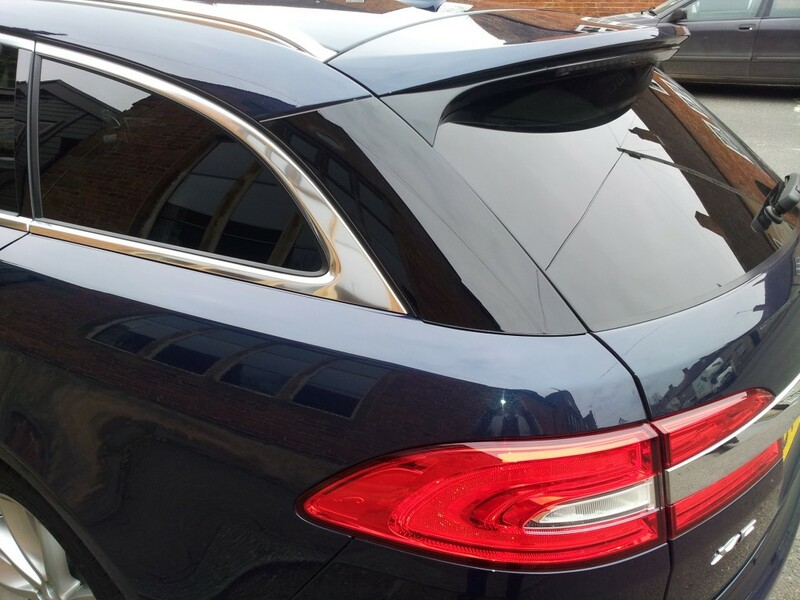 The team had to work with an XF platform that was never intended to take the additional bodywork needed for a practical estate. And yet, somehow, they have managed to turn it into the stylish wagon you see pictured here. 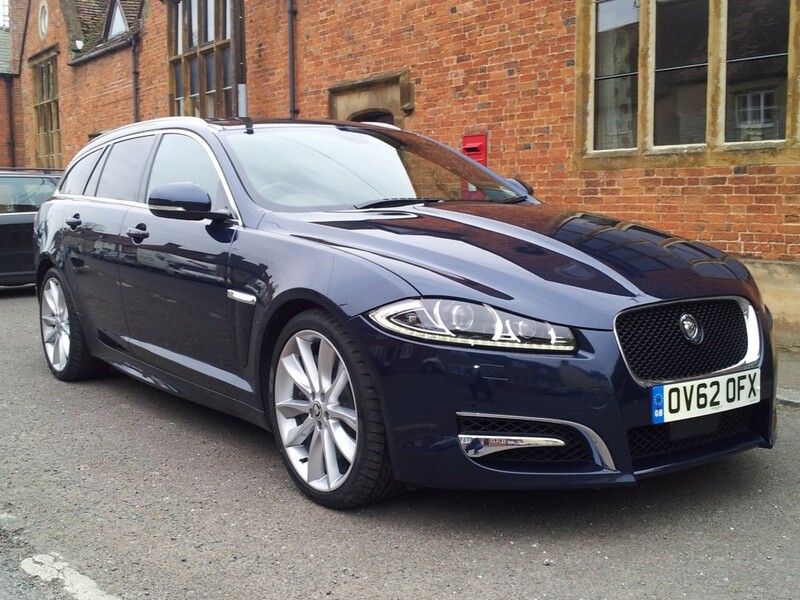 We were fortunate enough to test the top of the range ‘Portfolio’ model with Jaguar’s highly regarded 3.0 diesel engine. Style certainly doesn’t come cheap with the standard price (excluding options) being a whopping £51,505! It is also worth noting that only diesel engines will be offered in the UK, in either 2.2 litre (4 cylinder) or, like this car, 3.0 litre (6 cylinder) form. Each diesel variant is offered in two states of tune to suit your wallet and need for speed. Jaguar has pitched the Sportbrake as a stylish alternative to the more traditional estate models on the market and, despite its added practicality, it still maintains the sleek look that Jaguar are known for. To our eyes at least, it is the most handsome estate car on the market. At the front, the Sportbrake is a standard XF which means you benefit from an executive car that looks like no other on the road with its contemporary front headlights and chrome highlights. 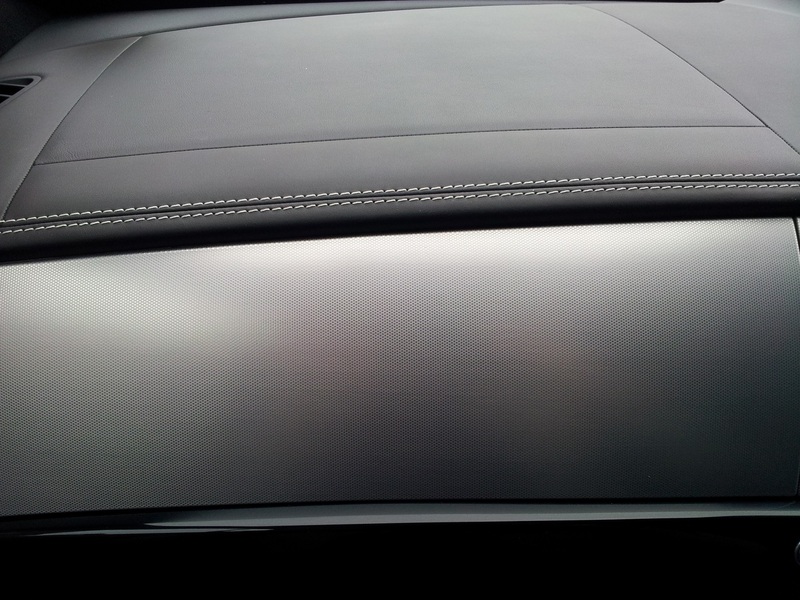 All models get the ‘power bulge’ on the bonnet to give an impression of muscularity. It looks imposing without being unnecessarily aggressive. The design really shines in profile form where, like any good tailor, Mr Callum and his design team have managed to hide the additional bulk necessary for an estate. Some nip and tucks here and there have led to a neat tapered roof with a wrap-around shoulder line. The rear of the car works well too with its LED strip lights and a chrome strip complete with Jaguar leaper mascot. It conveys an air of expensive taste and gives Sportbrake real presence with an appearance distinct from its saloon cousin. 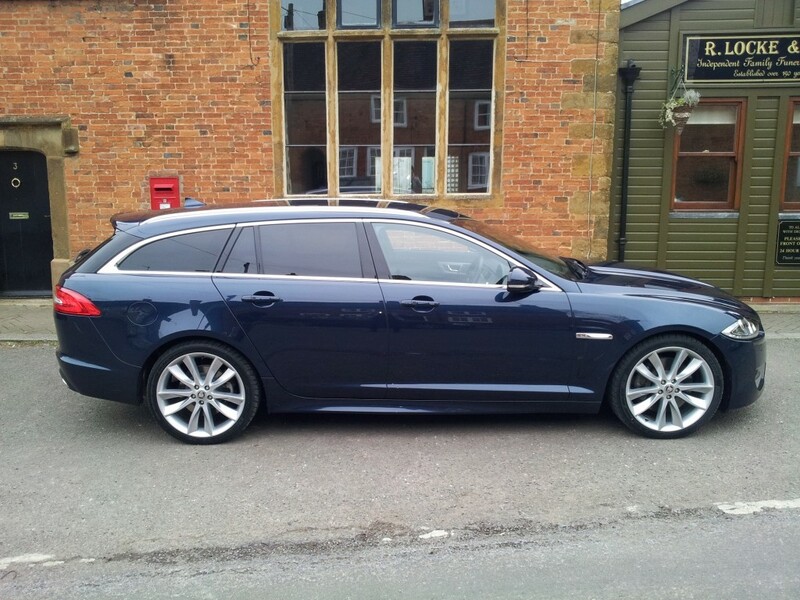 For those families that need the additional practicality of an estate but place style firmly high on the agenda then Sportbrake is the car for you. Step inside and it is familiar XF territory, no bad thing as it means you benefit from one of the best interiors on the market. 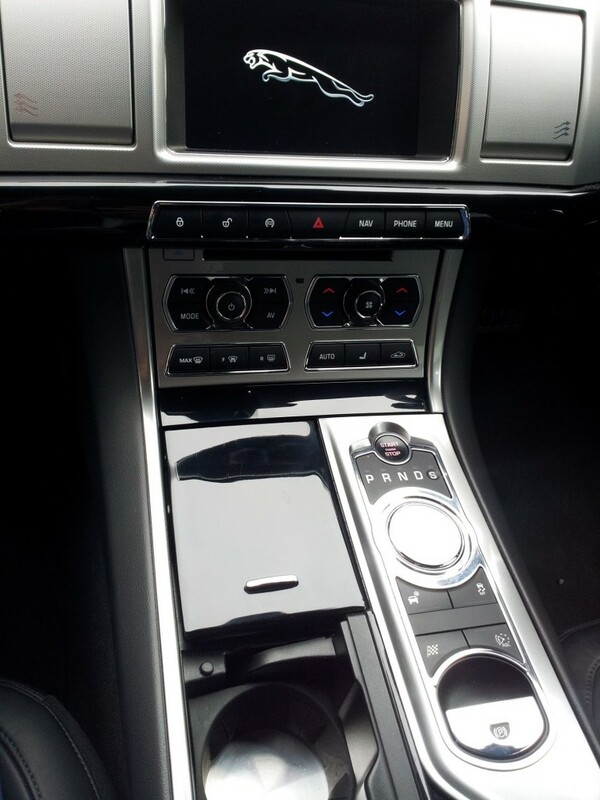 It has been a while since we sampled the XF interior but after an absence you realise still how satisfying it is. There’s still the novel touches of the revolving air vents when you turn on the ignition and the theatre continues as the knurled cylindrical gear selector rises to meet you. 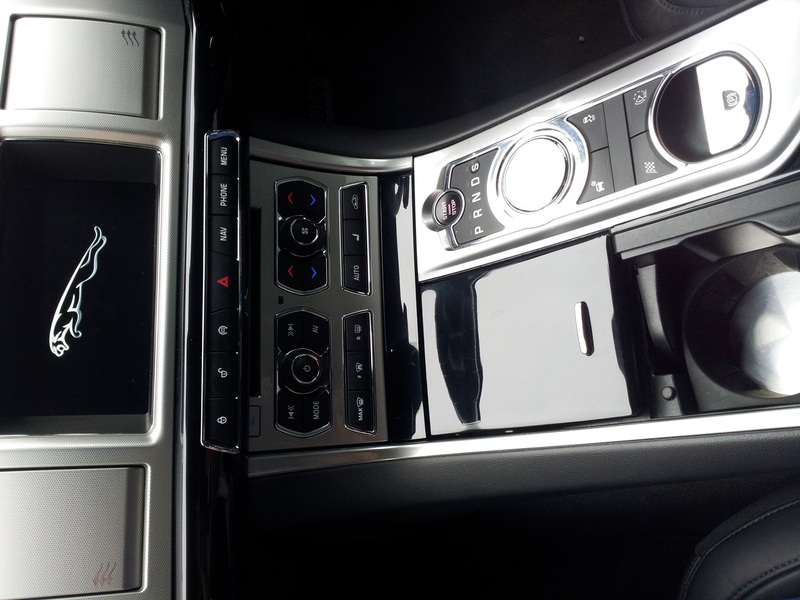 The one thing that has not aged well is the telematics system (satellite navigation/entertainment screen) which is starting to look clunky next to Jaguar’s nearest rivals. Switching between functions on this central screen takes longer than it should and the graphics look decidedly old-hat now. On the portfolio model of this car, buyers get treated to a leather stitched dashboard , suede headlining and contrasting stitching. The Sportbrake looks and feels expensive. There is also a high gloss piano black centre console which looks smart but, given its appearance, it is prone to smeary finger marks so keep a can of Mr Sheen and a duster handy! 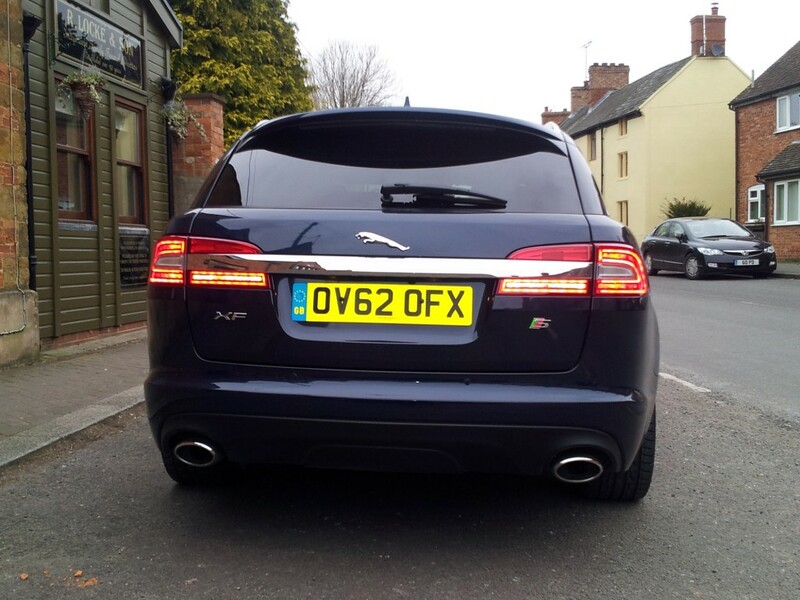 It is in the rear of the car where the changes over standard XF make themselves most known. The Sportbrake is decidedly more airy in feel, thanks to a bigger glass area from the unique rear door, with much improved headroom allowing you to recline comfortably complete, even with bowler hat should you choose! One note of caution, though, is to specify a lighter coloured interior if you want to enhance the feeling of spaciousness. As a dark interior colour can give too much of an enclosed feeling. The car would also really benefit from a full length panoramic glass roof rather than the small optional front sunroof to add to the feeling of space inside. The Sporkbrake model we test drove featured the 3.0 litre twin-turbo diesel in its highest state of tune and served to illustrate just how far such engines have come. Acceleration was very swift, reaching 0-60 mph in about 6.0 seconds, and given the high amount of torque (pulling power) available, it continued to pull like a train until we ran out of nerve. This then leads on to a problem and that is that you have to watch the speedo like a hawk to avoid any awkward conversations with the boys in blue. The Sportbrake weighs about two-tonnes thanks to its more practical bodywork which has blunted its performance a little when compared to the saloon but not so much that you would notice. 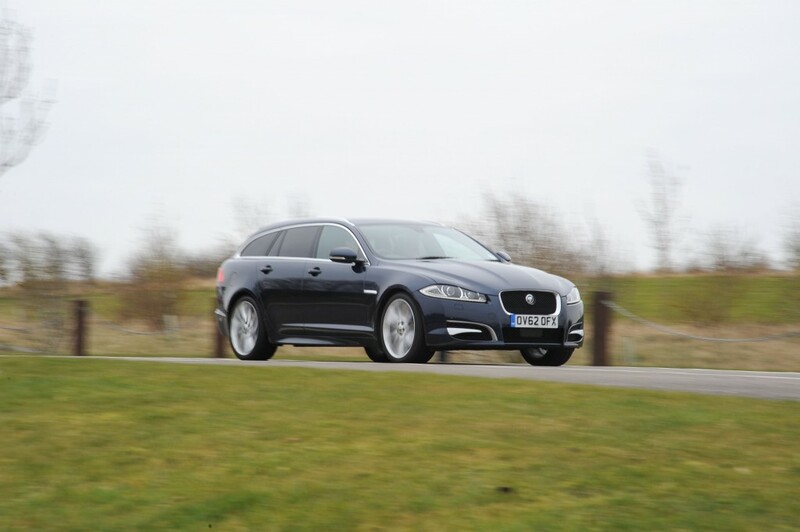 Being a Jaguar, the Sportbrake also manages the remarkable feat of blending a smooth suspension with one that allows the car to handle exceptionally well. This is a very difficult balance to achieve as anyone with a German car on big wheels will attest to. The Sportbrake can be hustled along a typical UK B-road with remarkable pace as it provides confident handling and the engine, thanks to the 8 speed automatic gearbox, is always on hand to provide surging pace. Attacking your favourite set of bends whilst changing up and down the gears via the steering paddles is great fun although not sure whether Rollo the family Labrador in the back would see it that way! It is a rewarding drive and gives any ‘Ultimate Driving Machine’ a run for its money as the enthusiast’s car of choice. Of course drive with a lead foot and those headline fuel economy figures of up to 46 miles per gallon will prove strangely elusive as you’ll be stopping to enjoy Mr Shell’s hospitality more than you would like. This is an estate car so it cannot simply be a case of style over substance. Leaving the rear seats up, the cargo room at 550 litres is the same as the XF saloon. But you do gain from a higher roof line in which to load above the window line. Convenience is aided by the power tailgate of this model (optional extra) but all models benefit from a floor rail fixing system. 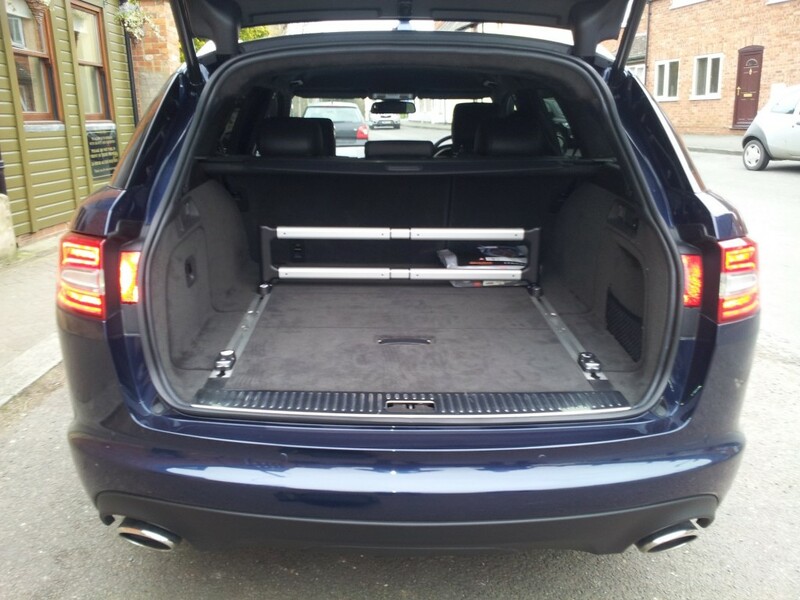 For those times when you need your stylish Jaguar to perform more as a removals van, the Sportbrake offers a party trick where you can pull remote-fold levers which extend the storage space to a massive 1675 litres and nearly a full 2 metres of neatly trimmed floor length. 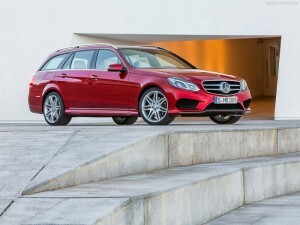 Sportbrake is on a par with the equivalent rivals from Audi and BMW, only the Mercedes E Class offers more. The Jaguar XF regularly tops ownership satisfaction surveys and the Sportbrake, we are sure, will continue this. The other good news, from an ownership perspective, is car valuation experts predict that this model will hold on to its value better than the other equivalent German rivals, retaining 40% of its value over three years. If your priority is low running costs, we would suggest opting for the smaller 2.2 diesel unit which offers 50 plus miles per gallon economy. The Sportbrake, like its saloon cousin, continues the stylish theme offered by the XF range and offers a compelling ownership proposition. It is not the most practical estate on the market, but it is certainly the most stylish and it combines this with sufficient practicality too. It is that rare car that offers both style and substance. Pros: A great drive with fabulous choice of fuel efficient engines. 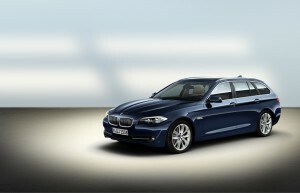 Cons: Expensive options and a bit plain looking when compared to the Sportbrake. Pros: Beautifully built with a huge load space. Cons: It is expensive and some of the interior plastics are of a low quality. 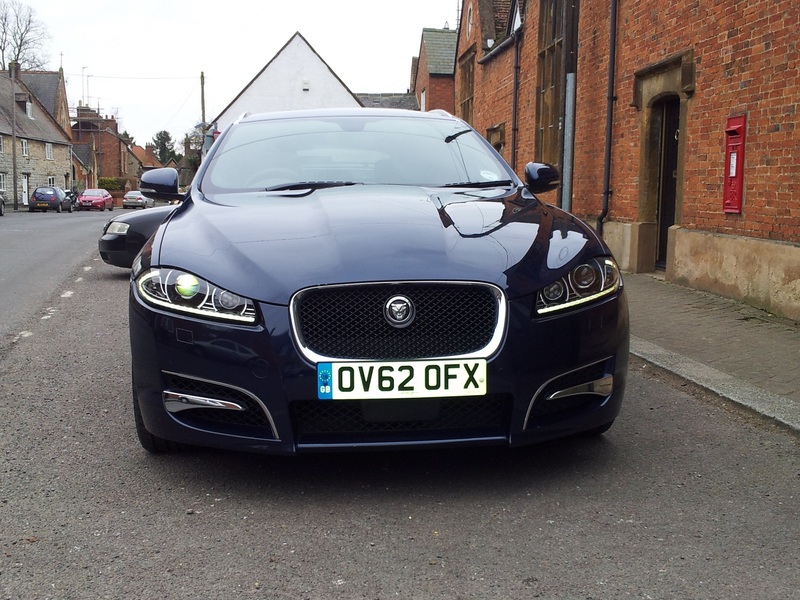 This entry was posted in Car Reviews, Jaguar, XF and tagged Audi Avant, BMW 5 Series Touring, car buying advice, car finder, car reviews, easiest way to buy your next car, Jaguar, Mercedes E Class Estate, My Car Coach, MyCarCoach, Nick Johnson, personal car expert, Sportbrake, XF by Mr.CarCoach.. Bookmark the permalink.